The main focus of the VRoBIT will be the MSX system, since you can insert physical MSX cartridges and it implements from MSX1 till MSX Turbo R.
In the case of MSX system, the main focus of the project, it emulates the sound chips : PSG, SCC, SCC+, OPLL (MSX-Music/FMPAC), Music-Module (MSX-Audio), OPL3, OPL4, SID. Some of these sound chips are very hard to find and expensive and the VRoBIT has all of them integrated. It also has the V9990 chip that it will let us play games with requiere that graphic potential such as Intruder or the near pixel perfect conversion of Ghosts'n Goblins. It has 4 slots so you can insert the MSX cartridges you need (if you want to insert the game with the V9990 and OPL4, a slot expansor is no longer needed). The VRoBIT can be connected using SCART connector to a CRT television or it can be also connected to a flat screen using HDMI. The creator needs that at least 1.000 users will be registered at VRoBIT website. If that happened, the VRoBIT HC4001 would pass to next step, the preorder. The HC4001 model is the one which has the mechanical keyboard integrated. If the creator doesn't receive at least 1.000 registered users, the project won't be released. Can all the people interested in the project register in VRoBIT website, please? In this stage we only need 1.000 users to be registered. This is a bit more money than I'd be able to spend right now, unfortunately, but I've spread the word on social media, as I really want to see this succeed. "You can connect a USB floppy drive and the system detects it. At the moment, it works at a high level and we do not have a low level driver to access protected disks." Is this planned to be addressed in a future firmware update or something? 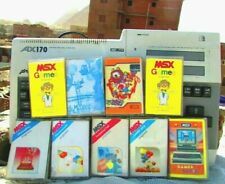 The lack of a floppy drive is basically the only flaw I can see in an otherwise pretty flawless-sounding product, and the inability to support protected disks at launch means the system won't be 100% compatible with the MSX's library right away (since the majority of commercially released disk games are protected). If it's going to be addressed in the future, however -- which I assume it will be -- then it's an exceptionally minor gripe in an otherwise ridiculously impressive package. I'd rather see it supporting .DMK files. Those old floppies are becomming less & less reliable. Incredible! I just jumped on vinyl recently and bought myself old records, also stole a lot of my parents vinyls they used to play when I was a kid... And now tapes are the new thing?? (probably one day CD will be the new hot stuff!). In the music scene I like to listen to, the freaks only want vinyl. I like that idea. Same goes for tape. For both goes that every time you listen to it it wears out, but at least it has some soul which digital music will never have. Nowadays with digital downloads, if someone is going to buy the music on a physical medium, vinyl has a lot more character than a CD. I think that’s maybe the reason why vinyl is getting more popular again. Coulda fooled me! I've amassed a pretty huge collection of disk games at this point, and so far, every single disk I've ever bought plays fine. The one caveat to this is that every 1 in 10 has mold spots on the platter, which is the first thing I look for every time I buy a new disk game -- but moldy disk platters CAN be cleaned, and while I'm still learning how to clean them effectively myself, I've had numerous game disks cleaned by a friend of mine, and they all work good as new now. Funnily enough, I've actually had more trouble getting cassettes, and even some cartridges to play! 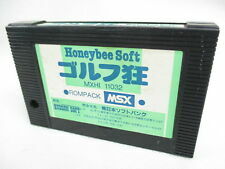 Disks have thus far proven to be the MOST reliable format I've yet worked with in my MSX collecting. Posted twice due to internet blip -- please ignore this message!